To be able to capture a picture of an Arctic Wolf in the wilderness is nearly impossible as they try to stay as far away from humans as they can. At Parc Omega in Montebello, Quebec, the opportunity to see these beautiful animals is more of a reality. 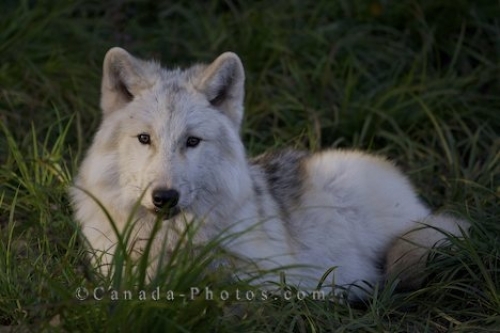 While driving through the park, an Arctic Wolf is relaxing in the green grass alongside the road, giving visitors a closer look. Arctic Wolf, Canis lupus arctos, at Parc Omega in Montebello, Outaouais, Quebec, Canada. Picture of the beautiful facial features of an Arctic Wolf in Omega Park in Montebello, Quebec, Canada as he rests in the grass.